Large swathes of coral in Australia are currently undergoing a massive bleaching event due to warmer waters caused by the El Niño Southern Oscillation. In a timely article published this morning in the journal Science, Australian scientists describe a protective mechanism which has enabled corals to survive when waters warm. However, the scientists warn that a tipping point in warming could easily be reached this century that will make coral recovery much more difficult. With as little as 0.5 °C extra warming, corals could lose this protective mechanism. Below, experts respond to the current bleaching events and to the new research. John Pandolfi is a Professor in Palaeoecology and Marine Studies at the University of Queensland. His comments below refer to the current bleaching event in the Solitary Islands. The coral bleaching event that is wreaking havoc in the northern part of the Great Barrier Reef is also being expressed along the subtropical coast of eastern Australia. Preliminary work being conducted in the Solitary Islands near Coffs Harbour in northern New South Wales, led by myself and the ARC Centre of Excellence for Coral Reef Studies, shows widespread coral bleaching with a number of coral genera feeling the heat. The hardest hit corals appear to be the pocilloporids, (Pocillopora in particular, but also Stylophora), and the genus Turbinaria. However, other taxa, such as Porites are also showing substantial bleaching. Of particular concern is that in many places around the Solitary Islands, the two hardest hit corals are two of the most abundant. Moreover, some of the Pocillopora colonies are dying or have already died. Should mortality ensue for these two dominant corals on the reef, Australia’s subtropical reefs could undergo major changes in their biotic composition. 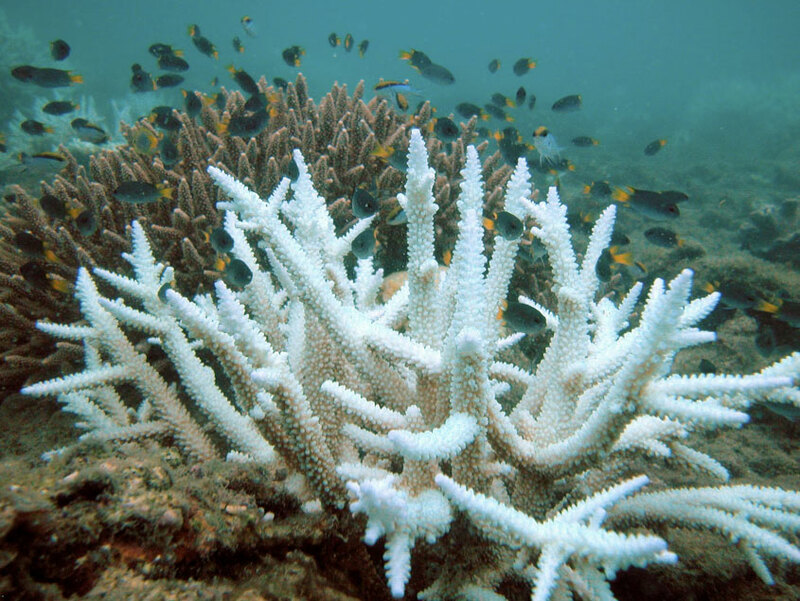 On the positive side, many of the hardest hit corals on the Great Barrier Reef, such as Acropora, are showing only minimal stress to the sub-tropical bleaching event. The Great Barrier Reef (GBR) is currently experiencing the most severe coral bleaching event every recorded. Aerial surveys of the entire Reef will be completed in the next few days by researchers from the ARC Centre of Excellence for Coral Reef Studies. Over the past two weeks, 765 reefs have been censused from the air, and over 100 underwater. These surveys will be completed along the entire 2300km length of the GBR in the next few days. The northern half of the GBR is severely damaged by bleaching, and on some individual reefs half of the bleached corals have already died. In the south, where bleaching is less severe, lightly bleached corals will regain their colour in the next few months as temperature drop. The underlying temperature of the GBR has risen steadily over the past 30 years due to global warming. As a consequence, the extra pulse of heat from recurrent El Nino events now triggers regional-scale bleaching events every few years. The first mass bleaching on the GBR was in 1998, the second in 2002, and this is the third and by far the most serious. The Ainsworth et al. study in Science shows that seasonal local weather affects the vulnerability of corals to bleaching during the peak temperatures of summer. This finding is directly relevant to the north-south pattern of bleaching we now see on the GBR. The southern section has been protected from bleaching by the cyclone that earlier passed over Fiji, when it brought cloud cover to the central and southern Queensland coast. Without that chance event, the entire GBR would have been even more damaged. This is an important study as it is one of the first to attempt to incorporate the past temperature history of stress events and hence acclimatisation into a predictive model of likely future tolerance to bleaching. This model is based on the last ~27 years of bleaching history in the GBR, with 1998 El Nino event being the most significant. This study is very timely as many of Australia’s northern coral reefs, including the GBR are now undergoing severe bleaching. This study combined with these ongoing events also highlights the difficulty in making realistic predicative models. In fact it now appears that what is happening in the GBR and also our reefs of North Western Australia, may even be worse than even these pessimistic findings. The difficulty is that the main drivers of bleaching are the highly episodic and very individualist ENSO events with the extent of bleaching depending on the particular characteristics (e.g. timing, SST anomaly, duration, spatial distribution etc) of each event. The study of Ainsworth et al provides further evidence that since these events are superimposed upon an already warming oceans, the threshold of corals to bleaching is increasingly being exceeded. The still unanswered question though is at what rate does acclimatisation/adaption to the warming temperature regimes occur. Unfortunately, there is still no evidence for adaption, implying that it requires much longer timescales compared to rates of global warming. This means that with ocean warming, effectively all reefs are now vulnerable to bleaching from strong ENSO events. Evidence for this is still unfolding with the 2016 El Nino, where exceptionally warm water has build-up and remained across northern Australia. Coral reef surveys conducted by the Arc CoE are finding that the northern GBR of Queensland and Kimberley region of WA are all undergoing what appears to be unprecedented severe bleaching and associated coral mortality. The severity of this event is such that the details thermal trajectories and opportunities for acclimatisation appear to be of little relevance. Corals regardless of their thermal history appear to be extremely vulnerable to the prolonged (weeks to month) exposure to the anomalously hot (>1- 2 oC) waters. This is bad news for corals globally, as no reef-systems are immune from such events.